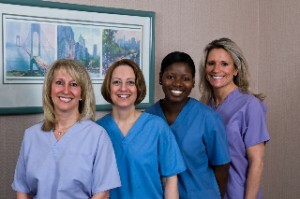 Our team of dental hygienists is pleased to serve the Stamford area, and our staff members are committed to patient care. If you are interested in learning more about cosmetic dentistry or would like to schedule a consultation with Dr. Edward Shukovsky, we can provide you with the assistance that you seek. Our team strives to create a comfortable, inviting atmosphere for our patients, and we work alongside our patients to help ensure that their aesthetic and functional goals are met. We invite you to contact our team of dental hygienists today. Dianai is the friendly voice at the end of the line. A native of Haiti, Dianai brings her island persona to our office; calm, easy going, and always sweet. Dianai keeps the front desk organized and is available to answer any of your questions. Jackie is a Registered Dental Hygienist (RDH) and loves her interaction with patients. She has been with the office almost ten years but took a break to live in London for two years. She missed the office terribly and came back just to be with us! Actually, Jackie, like our entire team, plays well with others and enjoys being back in the USA and our office. “There have been so many changes since my return from London: technology, lasers, digital x-rays, photography. It has been a steep, but fun, learning curve,” says Jackie. Andrea is one of our two RDHs (Registered Dental Hygienist). This is her twentieth year with our office, which is totally amazing considering the fact that that she is only twenty eight! Andrea enjoys the patients, making them comfortable and communicating what the latest dentistry has to offer. Under the guidance of Dr. Shukovsky, our team of dental hygienists can help improve your smile and your self-confidence. If you are considering cosmetic dentistry, orthodontic treatment, restorative dentistry, or general dentistry, please feel free to contact our dental practice today via the enclosed form or by calling us at 203.428.4487.